From 145 to 150 € the night I book ! In the charming little hamlet of Les Eydieux, Les Suites de Campagne enjoys a natural setting between rivers and volcanoes. An ideal address for a country escape... Lovely garden. 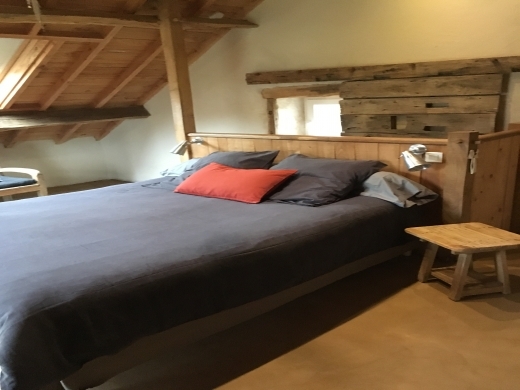 The suites are self-contained, giving onto the garden and are situated in the converted outbuilding of this traditional renovated farmhouse. A harmony of charm, authenticity and design, they are conducive to pampering and relaxing with either the balneo bath in one or the hamam in the other. Homemade jams accompany the tasty country-style bread at breakfast, served on the private terraces of the rooms or in the conservatory, depending on the weather. An easygoing, friendly welcome. .
1 suite with balneo bath with chromotherapy, WC and TV and I suite with shower, hamam, WC and TV. 135 euros (2 pers.). Extra bed 35 euros. Baby equipment, bebysitting, games. Family suites. The closest station is Riom, located at 34 km. The closest airport is Clermont-Ferrand Auvergne, to 46 km.